Jo Malone recently launched its springtime limited edition collection, The Bloomsbury Set. Once again, the collection has an appropriately English theme. These five fragrances — Blue Hyacinth, Garden Lilies, Leather & Artemisia, Tobacco & Mandarin and Whisky & Cedarwood — were reportedly inspired by the Bloomsbury Group and artist Vanessa Bell's Charleston House in Sussex. I say "reportedly" because that information was shared in early press releases, although the Jo Malone website now only refers vaguely to "free spirited artists" living "an unconventional life in their legendary country house." Samples of Jo Malone's limited editions are hard to come by, so this review is based on visit to a Jo Malone counter and a generous application of two fragrances that particularly interested me. (Usually I try to wear a fragrance three times before reviewing it; my apologies for this relatively cursory research!) The visit itself was funny, because I let my "mask" slip a bit when I approached the counter. I rarely mention that I write about fragrance, for various reasons, but this time I did let my enthusiasm for the literary-artistic subject matter show. Handsome and well-groomed male sales associate: How can I help you? Me: Hello! I just wanted to find out more about this special collection. HAWGMSA: Are you familiar with the concept? Me: [enthusiastically] Yes! Virginia Woolf, Vanessa Bell, Lytton Strachey! HAWGMSA: [after a slight pause to get back on script] This collection is inspired by a group of artists and their country house in Sussex. Back in the day. In Victorian times. Sorry! Anyway, what did I think of the two fragrances that I wore that day? Blue Hyacinth is a floral inspired by the gardens at Charleston House, with notes of hyacinth, geranium and vetiver, and developed for Jo Malone by perfumer Yann Vasnier. It's a big springtime perfume that starts off as a nearly holographic evocation of hyacinth. It's sweet and sharp, with an intense green leafy note wrapped around the flowers. For a while I was reminded of Guerlain Chamade, an old favorite of mine. However, instead of settling into a mossy base with hints of fruit, like Chamade does, Blue Hyacinth gradually softens into a soapy lilac scent. It's pretty, although it feels a bit tame for its bohemian namesakes. Leather & Artemisia, also developed by Vasnier, was inspired by the house's library, with notes of absinthe, artemisia, orris, leather and cypriol. According to biographies, the Bloomsbury writers and artists did enjoy a glass of absinthe from time to time, and they were aware of paintings by Degas and Picasso that depicted absinthe and absinthe drinkers. I enjoyed the bitter green absinthe note in Leather & Artemisia's herbal opening. However, like Blue Hyacinth, Leather & Artemisia morphed into something different. It lasted on my skin as a more feminine woody-sweet iris with hints of vanilla, like a younger cousin of Frederic Malle Iris Poudre. And it lasted surprisingly well, for a Jo Malone "cologne" — all things considered, I wouldn't mind owning a bottle of this one. Speaking of bottles, I do like this collection's packaging. The bottles, with their abstract swathes of muted colors, pay homage to the work of Duncan Grant and Vanessa Bell, and the brightly polka-dotted and striped boxes refer to the decoration of their Sussex home. I still can't explain the odd omission of any specific Bloomsbury names (photos of Charleston appear on the Jo Malone website, at least), but I'd recommend visiting a Jo Malone counter to take a sniff if you're curious. Just don't let on that you know too much. 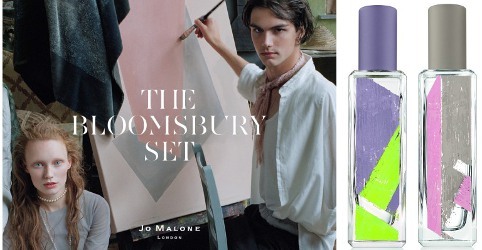 Jo Malone The Bloomsbury Set Blue Hyacinth and Leather & Artemisia are available in 30 ml ($70 each). Thanks for the review Robin, these are the two that I’m most interested in as well, but probably won’t be rushing into London to try them any time soon. Coincidentally, I live in East Sussex, very near to Charleston, which is one of my favourite places to visit, Monks house where Virginia and Leonard Wolf lived (National Trust) is also worth a visit. I enjoyed revisititing the Bell and Grant paintings at The Tate Modern a couple of weeks ago too! Doesn’t sound like Jo Malone has done very much with the wealth of artistic and sensory inspiration on offer, I think the models look faintly ridiculous in some of the shoots, and wouldn’t be surprised if they they have never heard of the Bloomsbury set either, not that that matters parse, but just looks a bit fake and unauthentic, so I’m not surprised to hear about you’re handsome SA being a bit vague! The models do look a bit vapid to me, too…they’re no Virginia Woolf et al, that’s for sure. Oh, how lovely to live near these homes! I’ve only seen photographs. I was fortunate enough to hear about some of these writers and artists in college, and I went on to read Woolf on my own and to seek out their work when I went to London years ago. I know not everyone is a specialist on culture “between the wars,” but I can’t figure out why JM would take this circle as a starting point but then avoid any actual specific information about the whos and whens and whats. Sorry Jessica, I got names muddled! Yes, I feel very lucky to live here! Charlston Farmhouse is a very unique place, as so much of the interior is as it was in the early part of the century, and so much of it was made and decorated by the artists who lived there, murals, hand blocked wallpaper, lampshades, fabric covering sofa’s, even hand painted tiles in the kitchen, and of course paintings, and sculptures although most are reproductions, originals having been sold over the years. It’s a very lived in home, so very accessible as well as inspirational. I have nothing against Jo Malone, but scents themed after the Bloomsbury set feels a little outside their grasp. What’s next? philosophy developing scents based on the Algonquin Round Table? Ralph Lauren tackling the Beats? STOP! DON’T GIVE THEM ANY IDEAS. Serge Lutens doing The Bell Jar…oh, wait, yeah…. To be PICKY, they didn’t move to Charleston till 1916 and Edwardian ends in 1911, but definitely closer than Victorian…. Re the publicity material, maybe all the homosexuality and bed hopping was too racy for Jo Malone in the end? Maybe they don’t want to scare us off with too much intellectual content? They probably just don’t give customers (or SAs) enough credit. Hmmm … I wonder if something went wrong mid-project with JM’s treatment of the Charleston brand. It’s easy to see how that relationship could go pear-shaped. The scents don’t sound like my cup of English breakfast. If the day ever arrives when I buy something from JM, it’ll be Lime Basil and Mandarin. Have they ever bested it? I wonder…there are some nice detail photos of Charleston’s interior on the JM site, but otherwise it’s all slightly vague. I still love the shower gels in Lime Basil Mandarin and Orange Blossom and Grapefruit! — and I do like a few of the colognes, including Woodsage & Sea Salt and Blackberry & Bay. Plus, there have been a few limited editions that I should have bought when I had the chance — some of the tea-themed scents, and last year’s herb garden ones. Yes, the teas did sound good. Sadly, I don’t live near a JM counter so I usually miss the LEs. It would not surprise me if it was just never in the plan to try to teach SAs, all over the world, all of the details about Bloomsbury. What?! You don’t think so, Robin?! I know that you are right, Robin, about the explicitness of the tie-in with Charlston and that it was all okayed on all sides, and yet something does feel like it’s changed from the initial ad campaign and accompanying pics and stories and what’s being said now. I keep thinking the descendant of someone tied to the circle but not to Charleston specifically asked for a cease and desist. My not so new paranoid spirit! Oh, could well be! I claim no knowledge. The only JM full bottle I own is the Black Pepper & Birch Tar from their LE collection a couple of years ago. That one has way better lasting power than most JMs and a really interesting India ink note (which is what sold me on a full bottle). I like a lot of Jo Malone scents but so many feel unfinished that it’s hard for me to bring myself to buy whole bottles. I wish there were more to the bases, because I love so many of the tops and hearts! Last year’s herb garden scents seem to be still scattered across various retailers and ebay. I am still considering getting Nasturtium & Clover. I need to dig out my decant..
Definitely not (in my v humble opinion…First bought it in Jo Malone’s tiny shop behind Knightsbridge (name of street forgotten but it was v smart!). None since has surpassed it. And doesn’t look as though any future ones will, either. Thank you for the review. I was interested in the other two and bought them. My favorite is the Tobacco and Mandarin but wore the Whiskey and Cedarwood yesterday and received a few compliments. That’s always a good sign. Yay! Whiskey and Cedarwood was the only one I liked much, but I did like it! But! I’ll do my own homework and any mention of hyacinth is going to grab my attention. Thank you for the review. Ahaha you cracked me up with the Coffret EDP(?) ???? I tried the Blue Hyacinth and Tobacco Mandarin on my wrists, and might have to get the former. It is very lovely and I am a sucker for both stemmy green and iris-tonka-powdery scents. Yep, the Chanel coffret is the “revamped” edp version of their former edt line of “Exclusifs” as far as I know. The buzz surrounding the whole shebang is mind-boggling. Yep I actually have the new coffret because I like hoarding all the samples ???? It is unfortunate that on average the EDTs were better / had a lot more character. I really wanted to love these. The bottles looked so inviting on line and the photographs of the gardens at Charleston are so beautiful, and the scents sounded lovely — but I ordered the set and then promptly sent them back. (JM does have good on line customer service, I’ll say that.) The box is oversized and unattractive, so the idea of gifting some with the box, which was why I went all in, was out the window. The bottles have a lovely design, but I think the execution is lacking. And most importantly, to me they all smell like . . . well, like not so inspired Jo Malone colognes. The one exception was Whiskey and Cedarwood, which has a nice boozy rose edge, but not enough to keep me interested and as I said, I was annoyed by the quality of the whole. Thanks for the review here! Maybe it’s the result of my living in the litigation-mad US, but my first thought too was that the artists’ estates might have objected to the use of their names without any remuneration. I took full advantage of the Rewarding Beauty Event at BG and the 15% off all beauty at Macy’s. I ended up with Tobacco & Mandarin, Whiskey & Cedar and Leather & Artemisia. Leather seems to be the most popular as it was out of stock at BG and just today, I did an even exchange (and somehow also got a $10 coupon for a future purchase) and got the last bottle! My favorite of the bunch is Leather & Artemisia! Nice! Those are my three favorites. I’m happy to see this (hilarious) review! I tried a few of these last week and nearly bought Leather & Artemisia. I’ll probably go back for it eventually. So tempting because it’s “only” $70. Whiskey and Cedarwood was my second favorite. I didn’t try the Hyacinth. I can’t help but wonder if the Bloomsbury group’s alleged anti-Semitist themes might play a part in why the mentions of Woolf et al. were stripped from the branding. Anywho, I tried these and wasn’t enamoured, sadly. I thought last year’s Herb Garden was lovely, and that any of those could easily have made for a permanent release. Not so with these. Thank you, Jessica, for a most entertaining review! Both of the scents you sampled sound at least sniffworthy to me, but then I’m a Jo Malone fan and enjoy any excuse to stop by one of their counters and spritz this and that until I’m clashing with myself and can’t wait to get home and take a shower.